It’s been a while since release 1.0.0, well short while at least. About a weeks ago we released a bugfix version 1.0.1 (Mac version 0.2), this was a rather big bugfix. Before 1.0.1 there was a lot of theading issues, that made the program practically broken on dual core Windows systems. We’ve fixed most of these issues, and now both the Windows and Linux versions have become more stable. The issues fixed in version 1.0.1 was those listed on our known issues pages. Well, today we’ve released a Linux version 1.0.2 and a Mac version 0.2.1, those are not very critical. Well the Mac release might be, since I discovered that the Mac version 0.2 didn’t start when the application was launched. It seams there was a typo in the packaging process, I fixed the typo and we’ve released Mac version 0.2.1. Which should be running now, requiring X11 and Mono. The problem with the Linux version was that the menu entry for playlist generation was dead, we’ve fixed, and the Linux version should now be capable of generating playlists. That’s the story behind the latest bugfixes, the Windows version 1.0.1 is still good. I’m still not done with the OS X client, hopefully I’ll manage to get an .app ready. Either using Windows.Forms or Cocoa#. I’ve had some success using Windows.Forms under X11, but the macpack utils won’t pack it correctly. Porting to Cocoa is kind of on hold currently, since none of the cocoa samples found can be compiled and no documentation of the C# bindings is available. Personally I’m pretty proved of the artwork, not because I want to take all the credit for it. The rest of TheLastRipper developer team, have done a lot here. They are also the guys I’m doing the school project with, they’re not much into programming, but they do know a thing or two about artwork. Well all the artwork was done in Inkscape 0.45, the new blur effect is just a little too nice. Some clipart has been “stolen” from public domain ressources at Wikipedia or OpenClipArt.org. 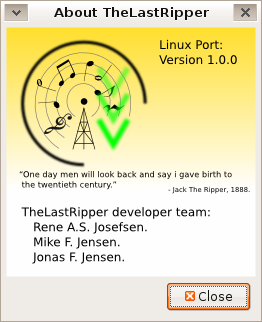 The last few weeks I’ve been working on a project called TheLastRipper, an audio stream ripper for Last.fm. It’s not all done yet, but it’s getting close. It’s written in C# and I’m planing to port it to both Windows and OS X using both MS .Net Framework and Mono. Currently there’s only a Mono/Linux client, it should be possible to port it to gtk#/Mono/Windows pretty fast, but I think I’m going to create a native Windows.Forms interface instead. Anyway, I’m here by making the first alpha version available for testing. Now I’ve never packaged anything before, so there’s no guaranties on the package. But it’s probably better than the tarball, since the tarball only installs two .Net assemblies, and no mono wrapper script in /usr/bin/ or menu entries. By the way, the project is part of a school project I’m doing in technology about copyright, music and luxury. This is relevant because in Danish copyright law, it’s legal to rip unencrypted audio streams, like Last.fm, but please don’t take my word for it, I’m not done with the project and I’ll look more into the Danish copyright laws later. The Danish Ministry of culture has a piece on copyright and audio stream ripping.